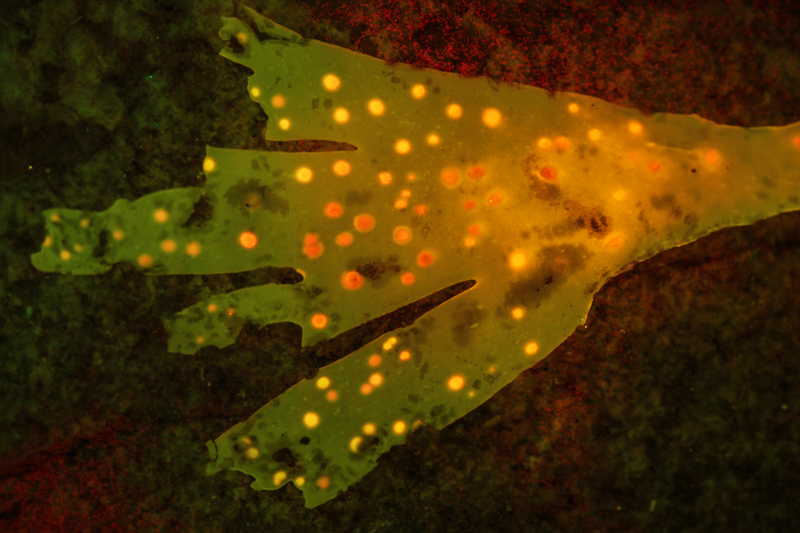 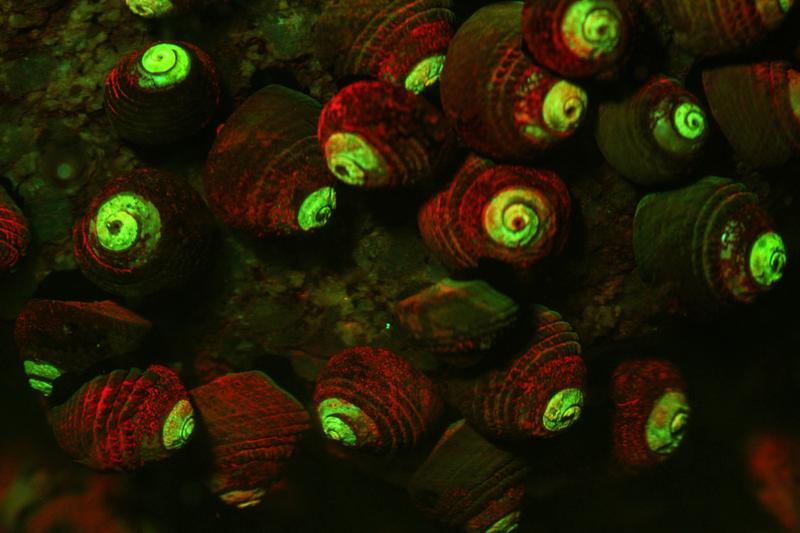 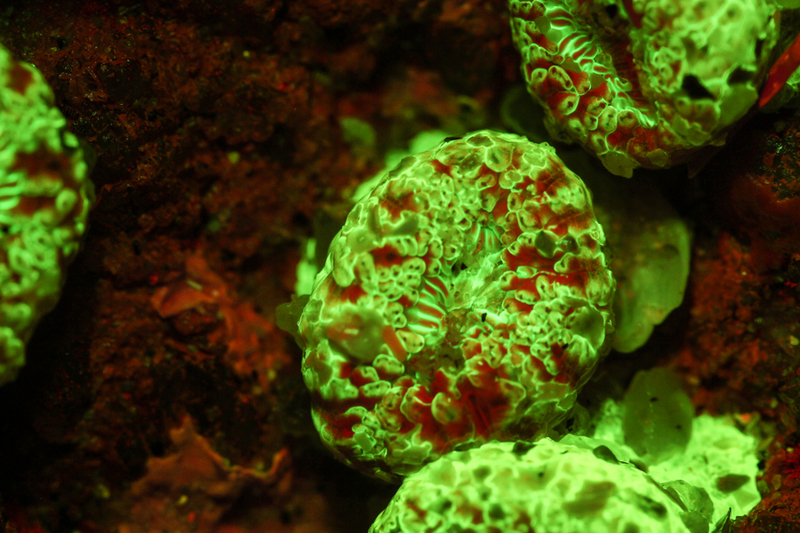 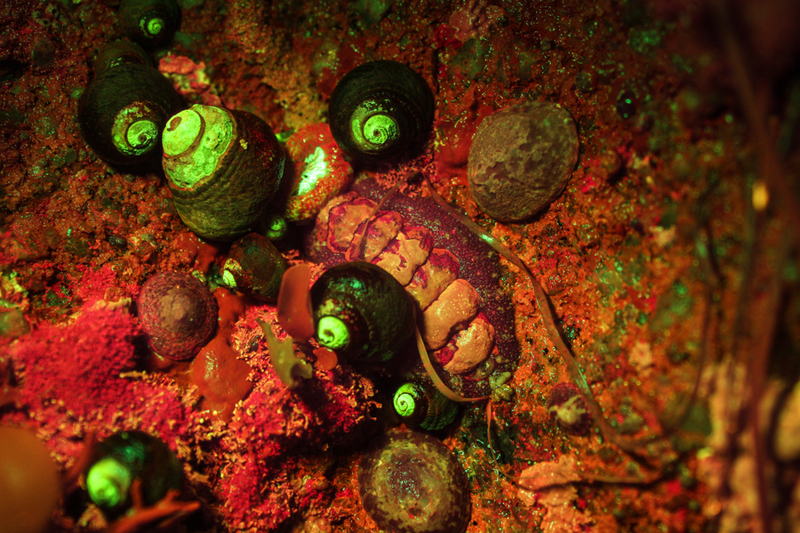 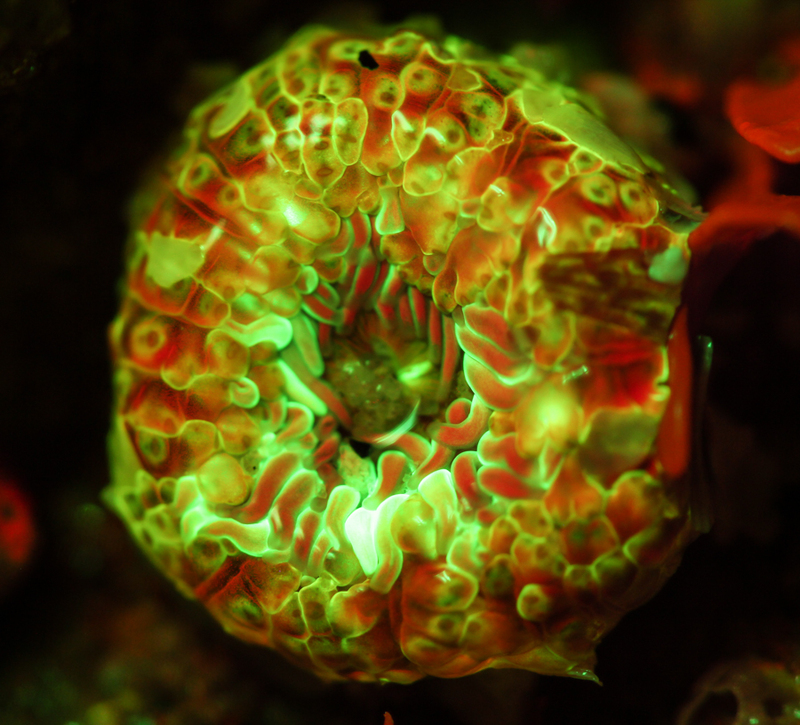 You don’t necessarily have to go underwater to enjoy the fluorescence of marine subjects. 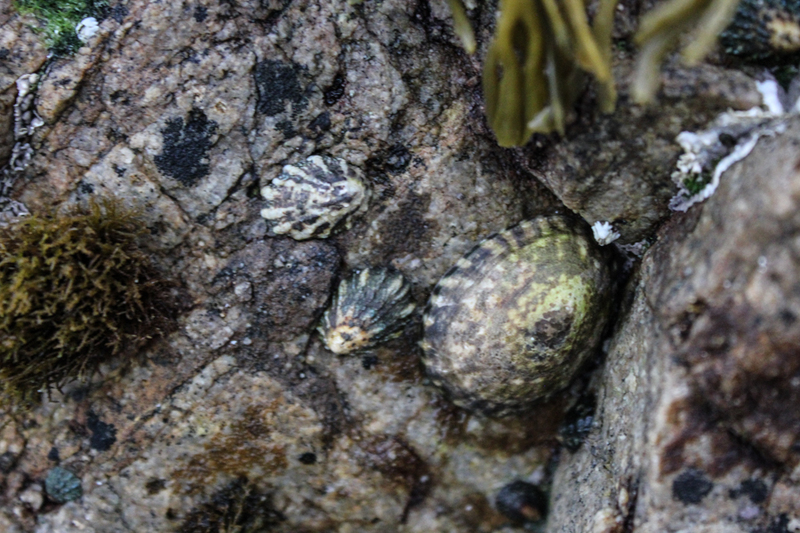 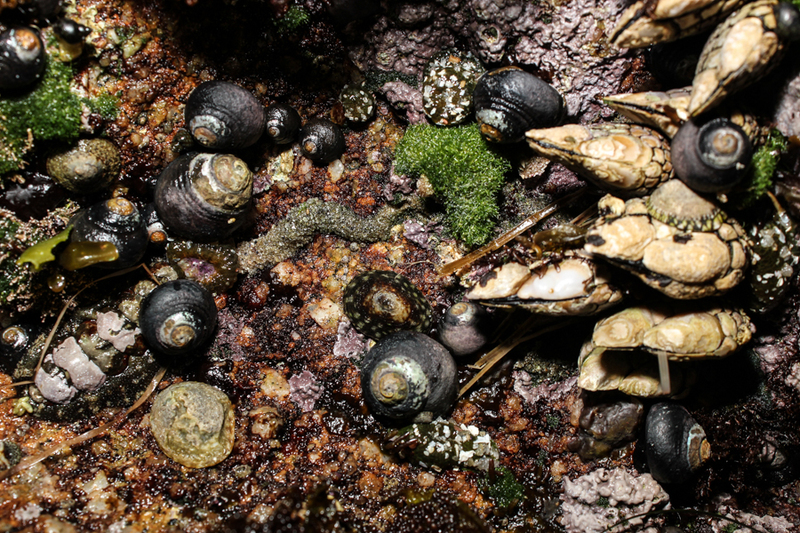 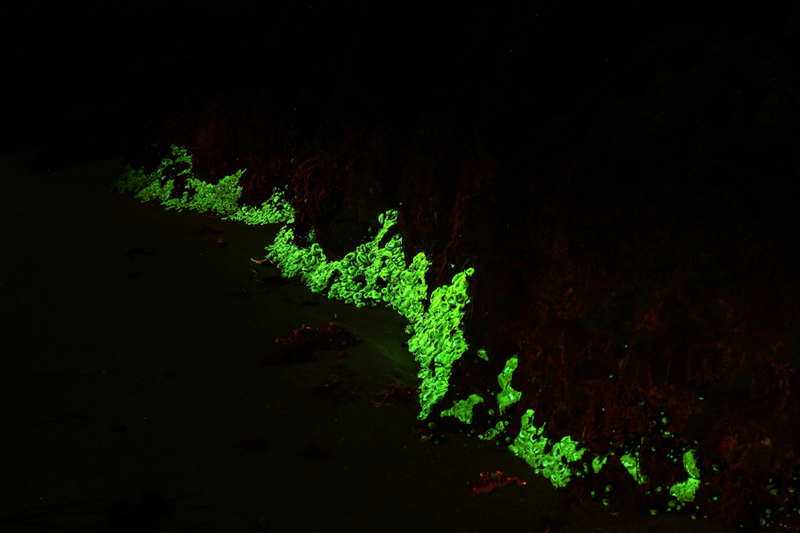 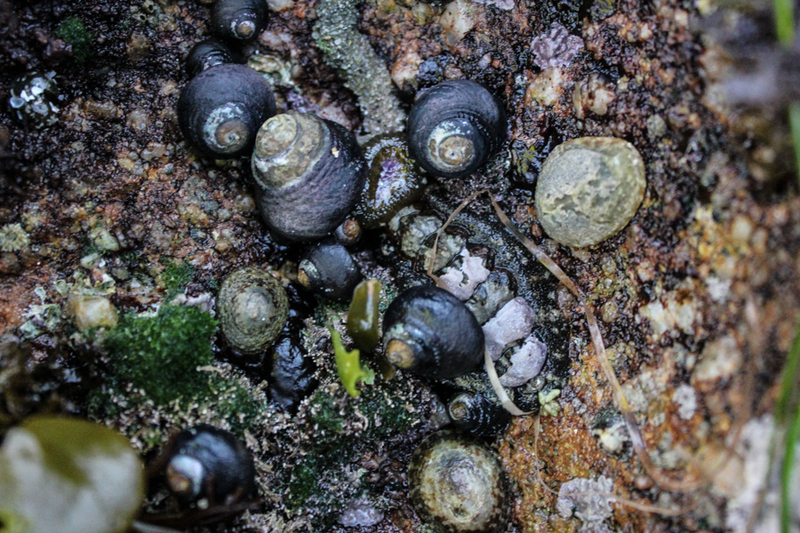 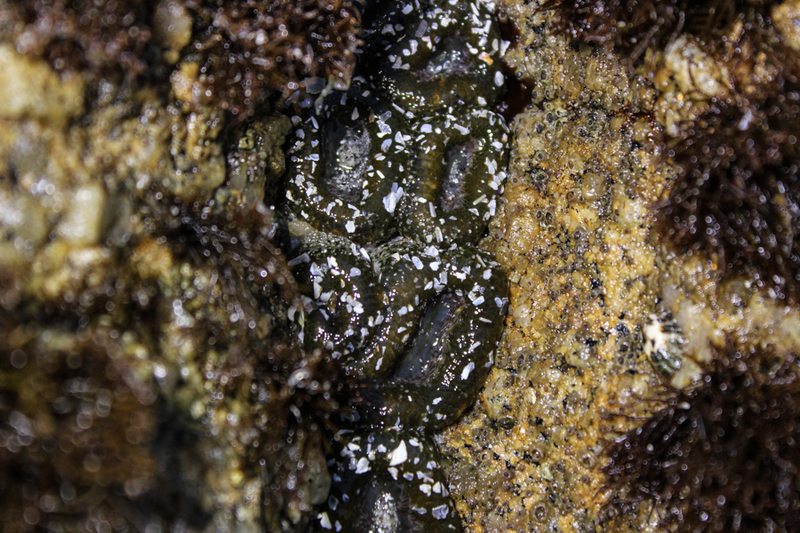 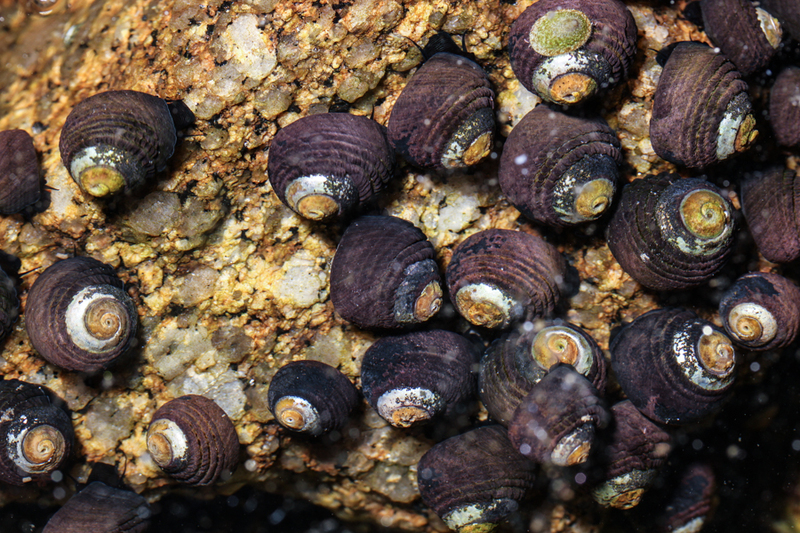 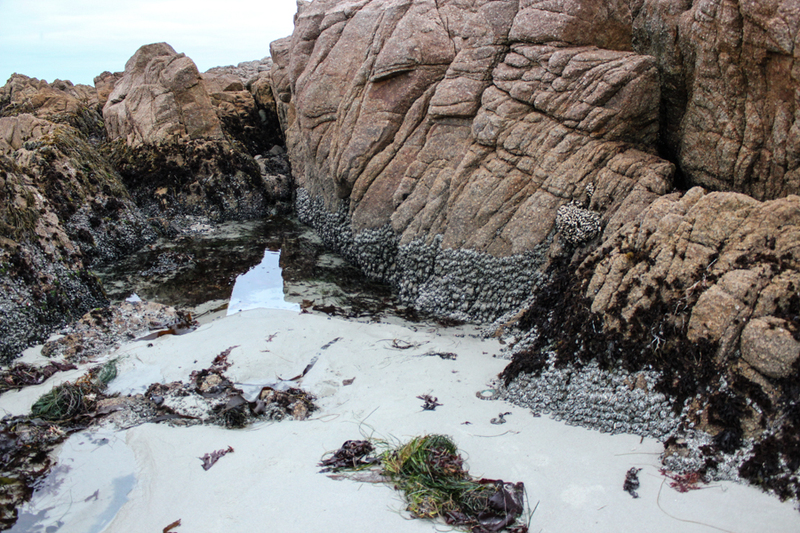 In many places you can do fluorescence exploration when the tide goes out, providing access to subjects in tide pools and on exposed rock surfaces. 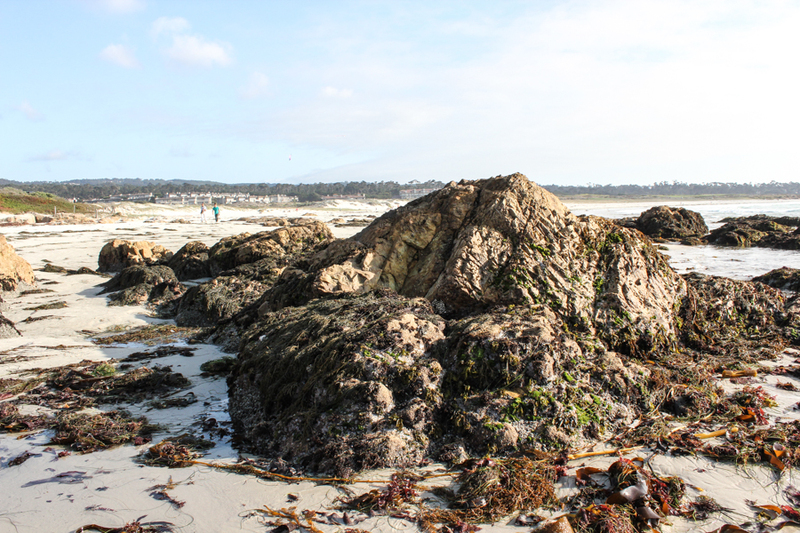 On a recent trip to the Monterey peninsula (California) the timing was right for low tides in early morning and not long after sunset. 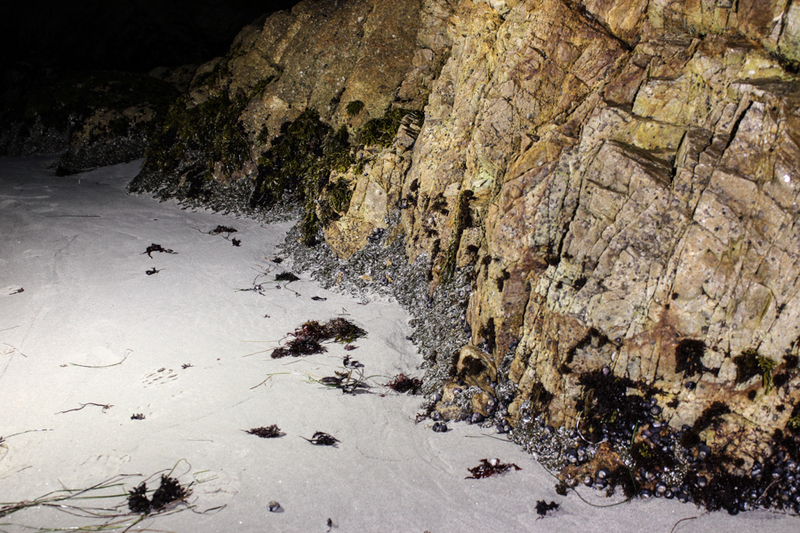 I made two predawn visits to the north end of Asilomar State Beach and one evening trip to the tide pools at the end of Asilomar Avenue. 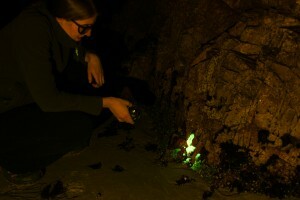 Kara Nordin (Northwestern University) accompanied me on one of the dawn trips. 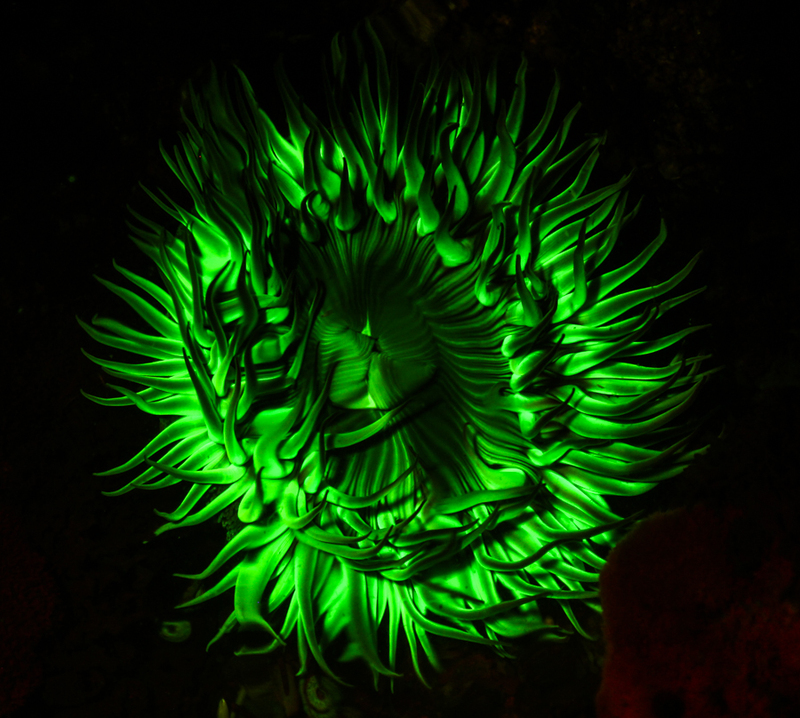 My friend Jeff Honda, a superbly talented underwater photographer/videographer who does fantastic macro fluorescence work (visit Jeff’s web site to see some of his work) and happens to live in the area, guided me to the evening spot. 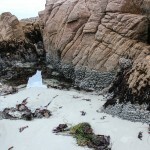 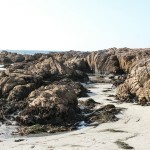 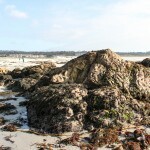 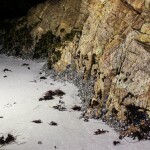 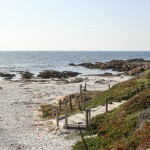 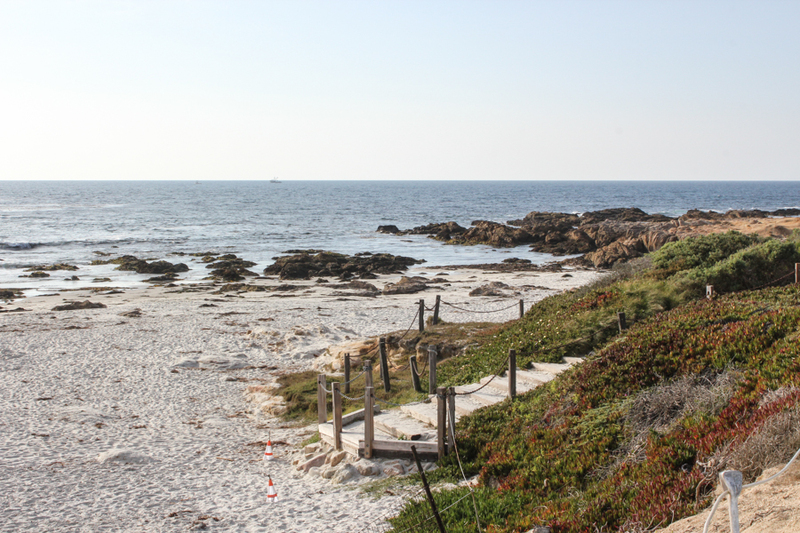 This set of images shows the setting at Asilomar State Beach. 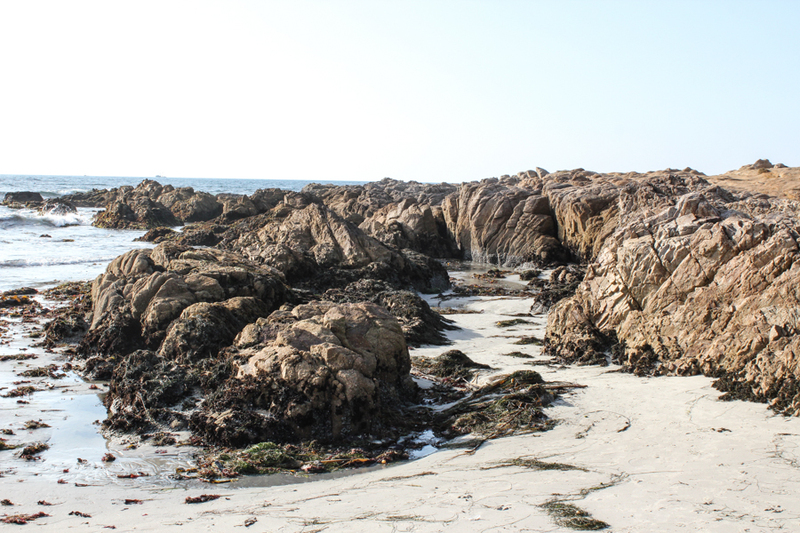 The rocks at the north end provide shelter from the waves and leave tide pools and richly populated exposed rock at low tide. 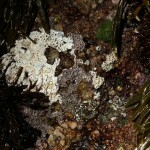 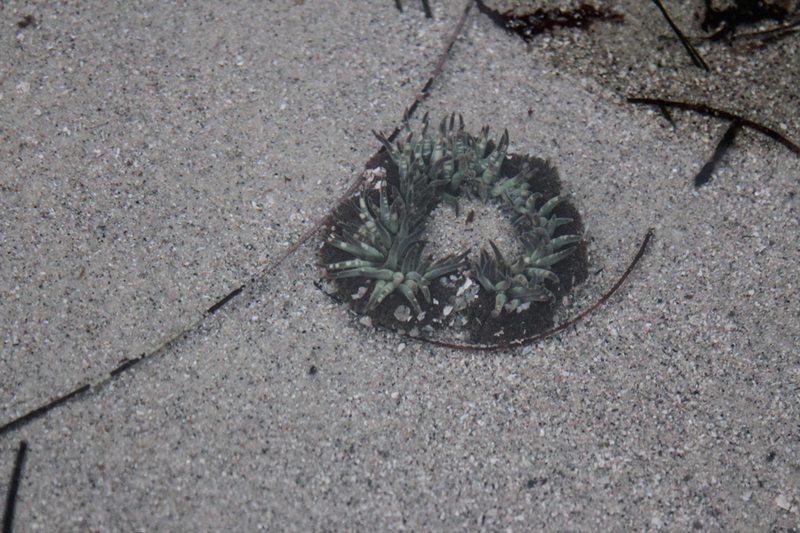 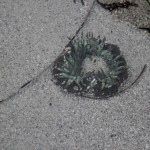 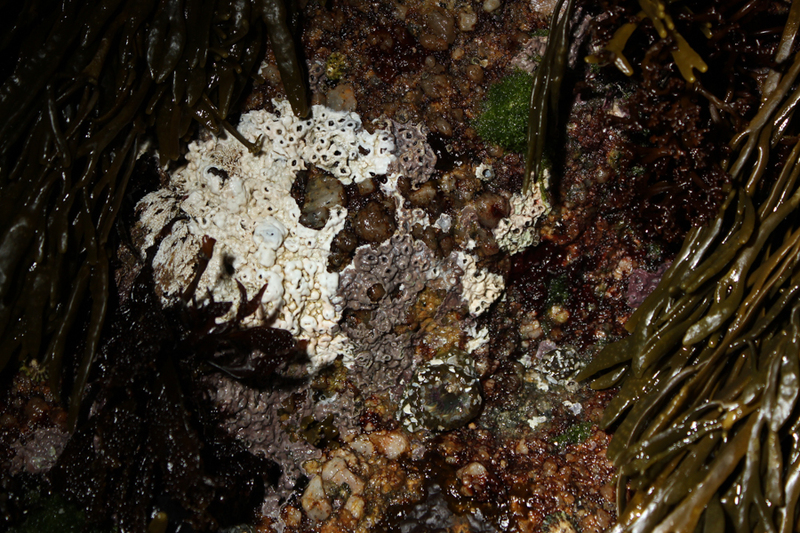 The grey band above the sand in the last picture above is a dense collection of the aggregating anemone Anthopleura elegantissima. 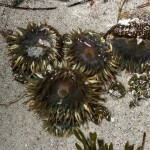 They open up with extended tentacles when submerged but when they are completely out of the water at low tide they contract into a ball. 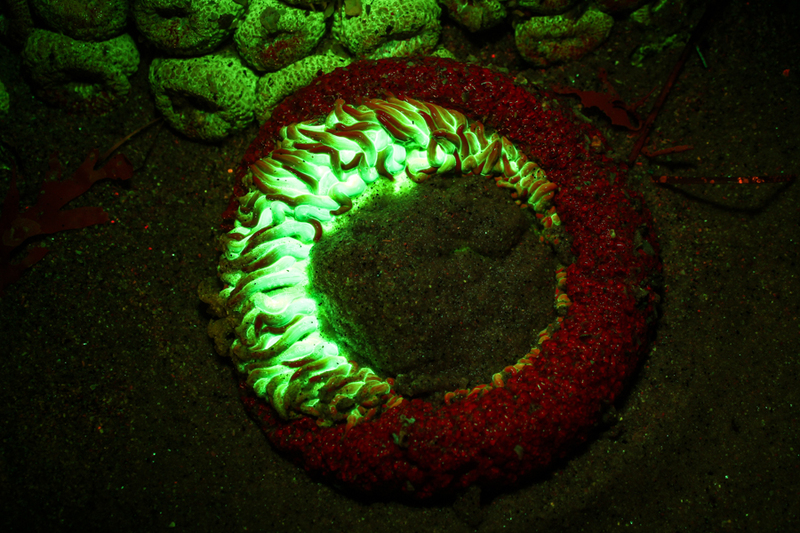 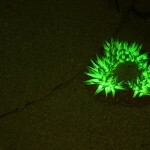 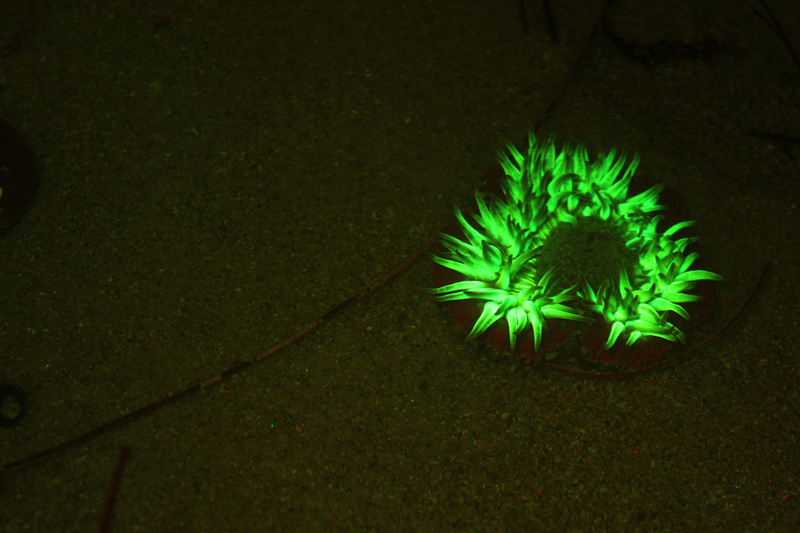 The photo below shows Kara Nordin shining a fluorescence excitation flashlight (Light & Motion Sola NIGHTSEA) at the surface, producing a green fluorescent glow from the naturally occurring green fluorescent protein in the anemones. 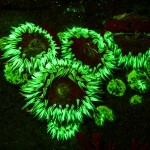 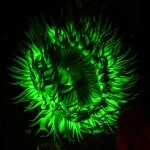 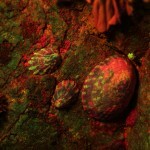 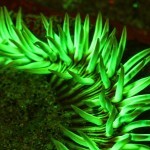 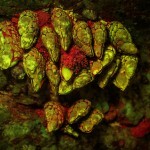 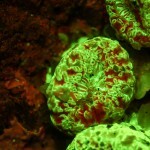 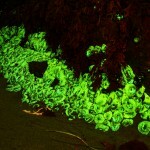 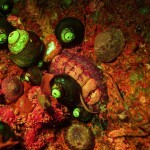 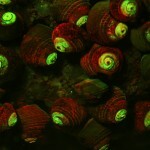 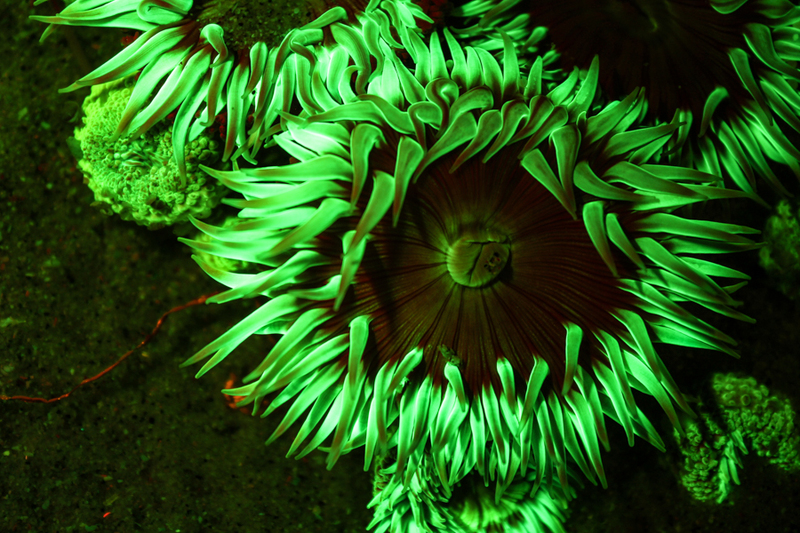 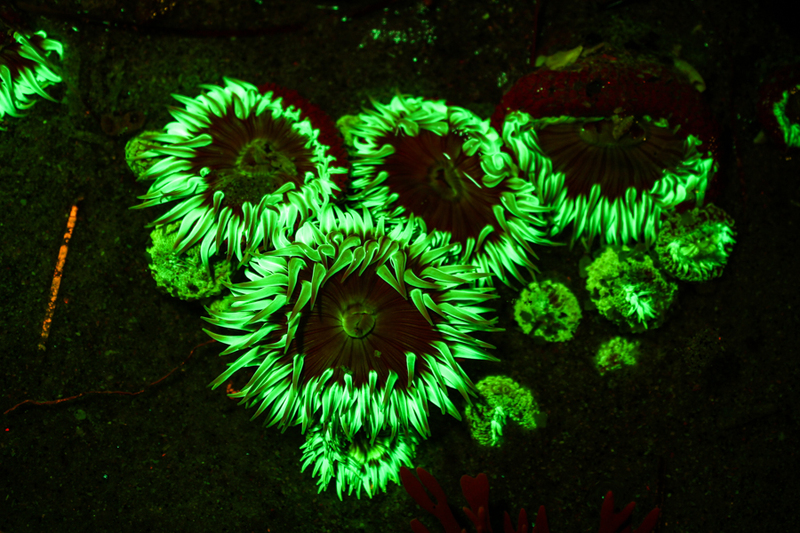 The images below that show wider views of these anemone-covered rocks in white light and fluorescence. 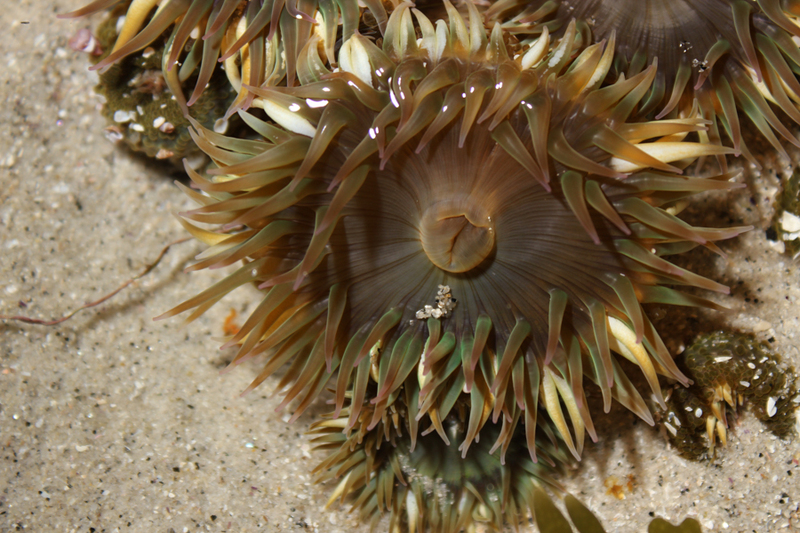 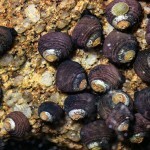 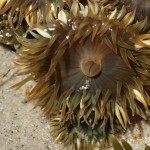 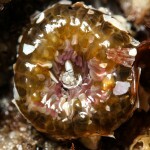 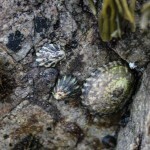 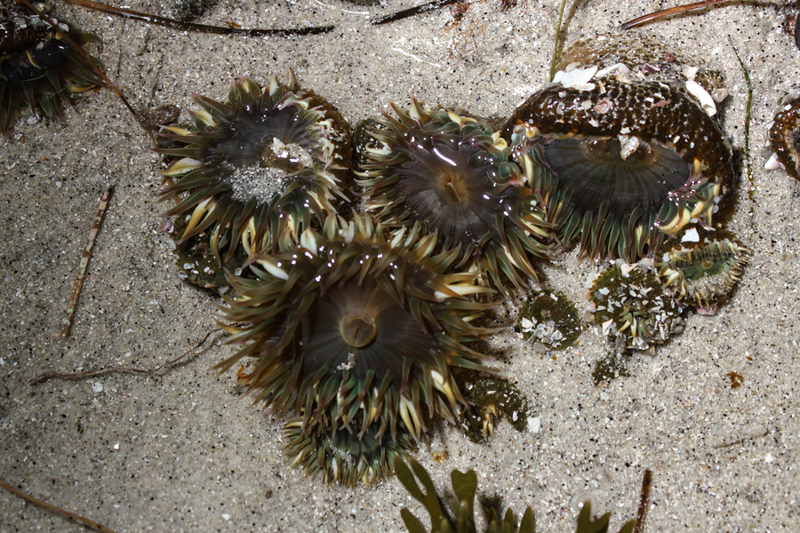 The images below show various closed-up anemones in greater detail. 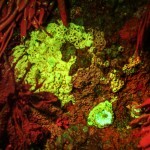 The red fluorescence you see in some of these images arises from chlorophyll in symbiotic algae. 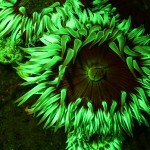 These anemones are spectacular when ‘unfolded’. 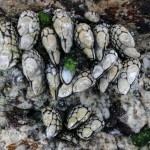 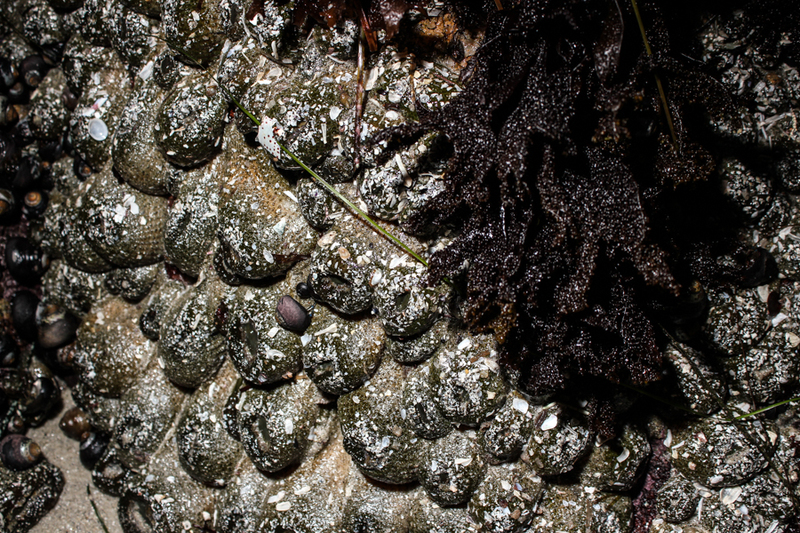 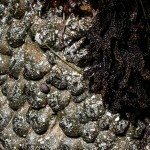 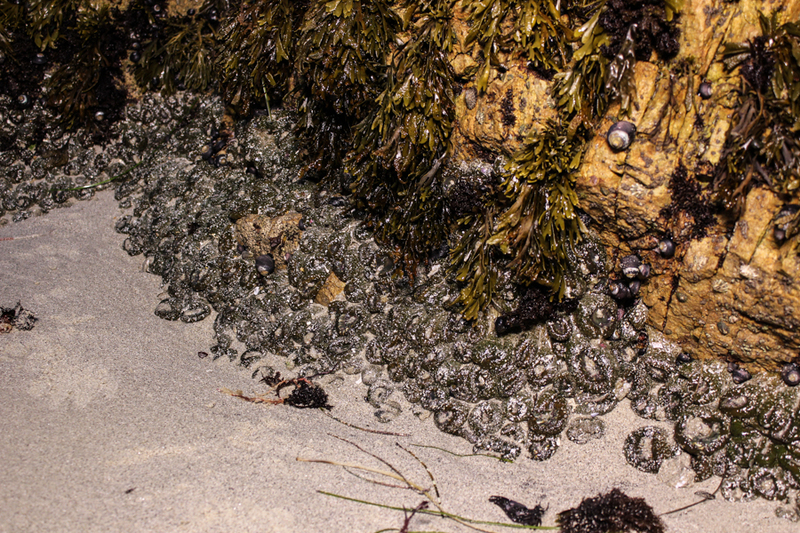 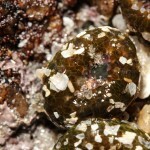 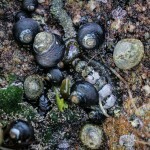 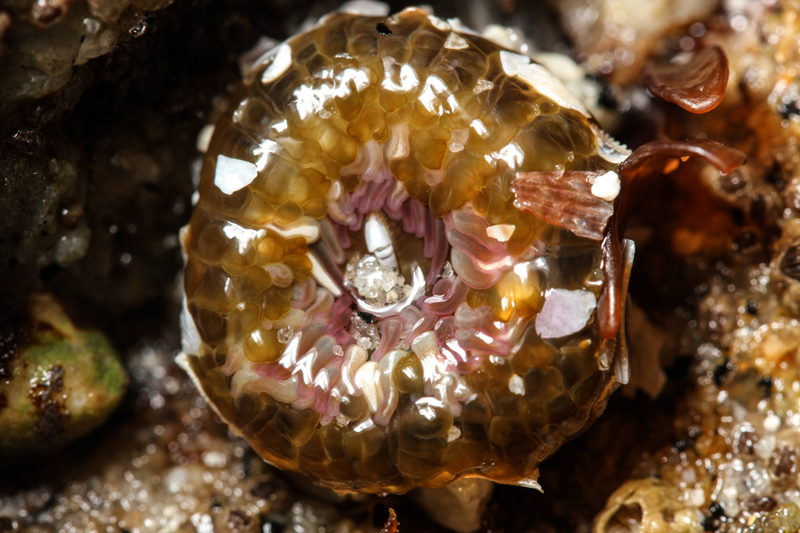 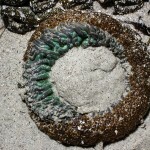 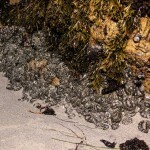 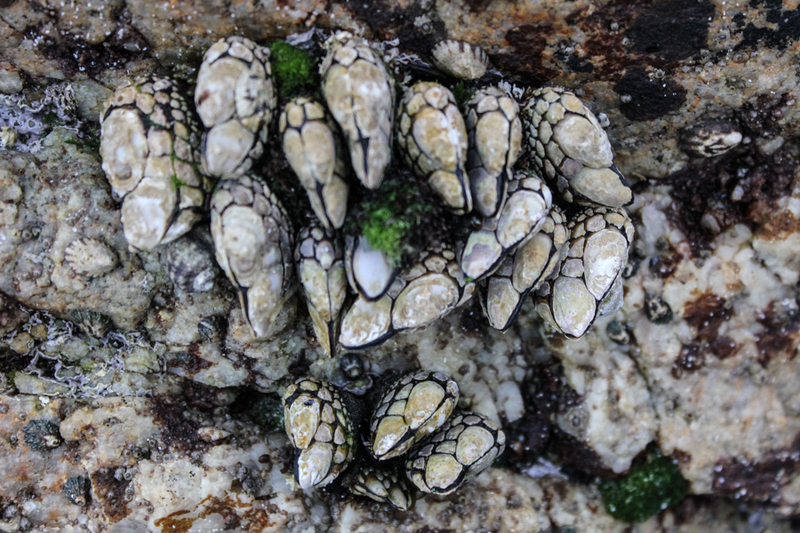 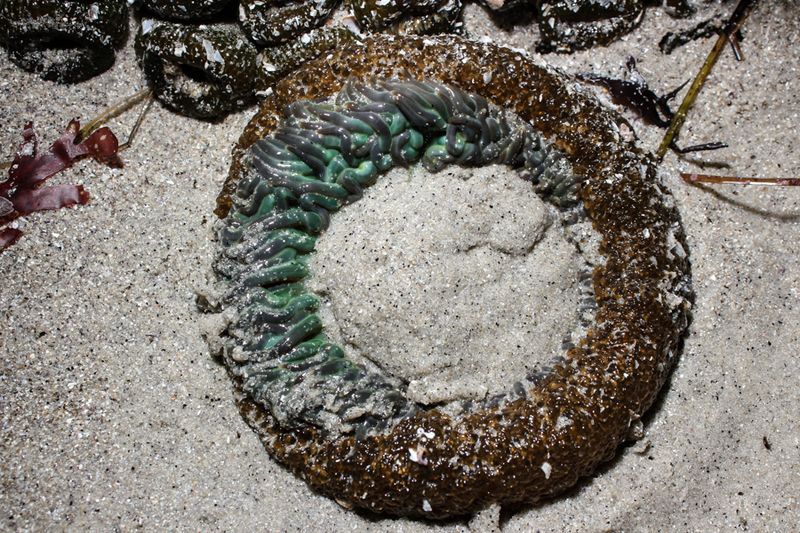 The first pair below hints at this – a largish specimen completely exposed on the sand, but with some of the tentacles visible – while the others show the true beauty of these specimens. 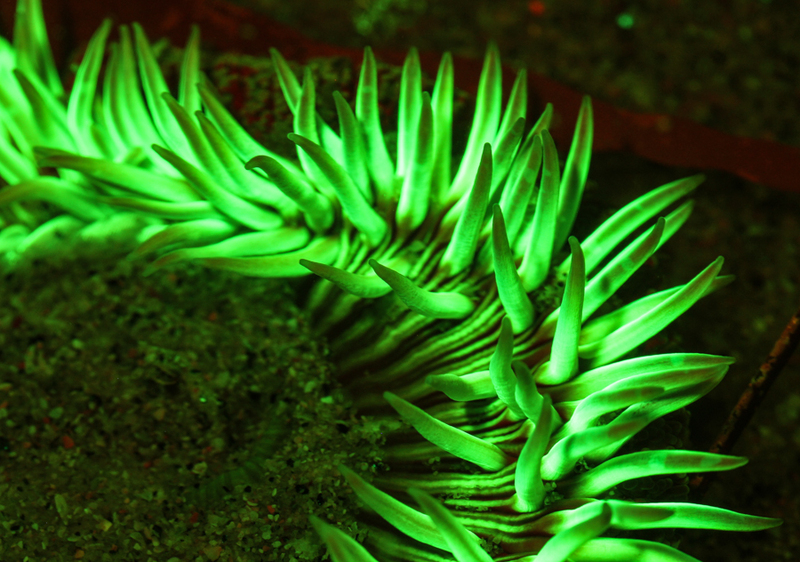 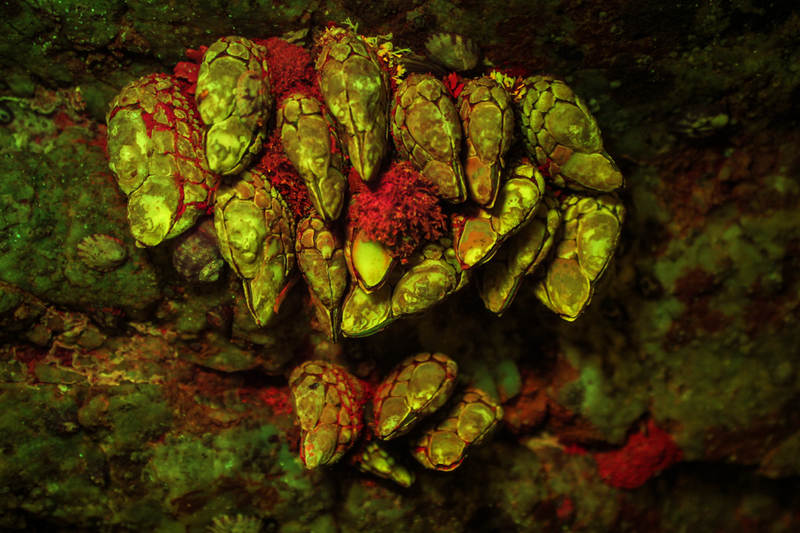 Anemones aren’t the only fluorescent subjects. 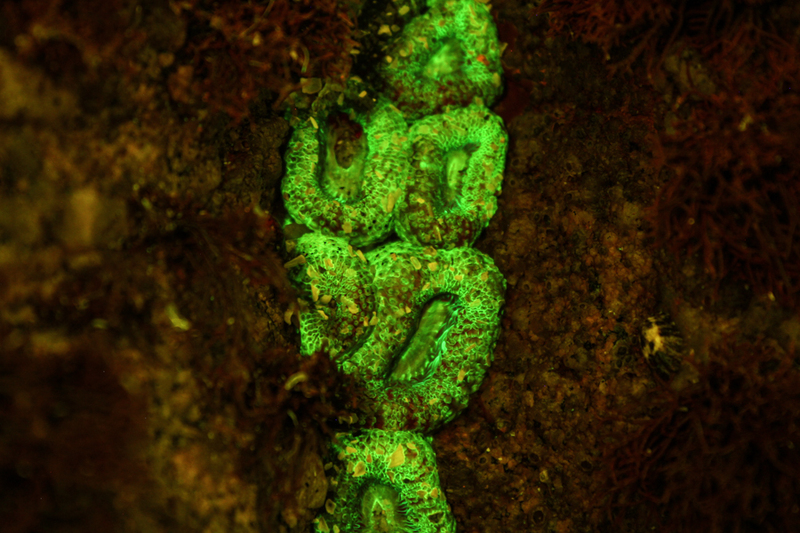 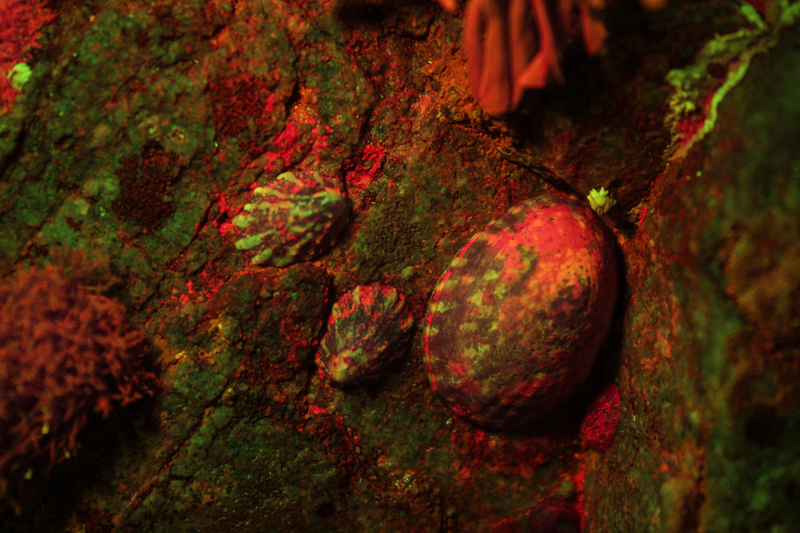 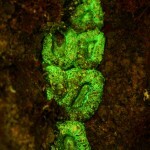 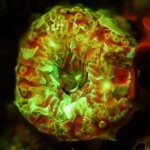 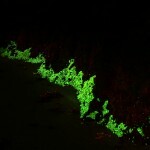 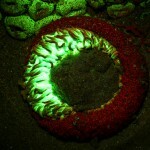 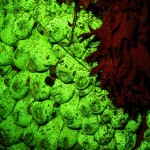 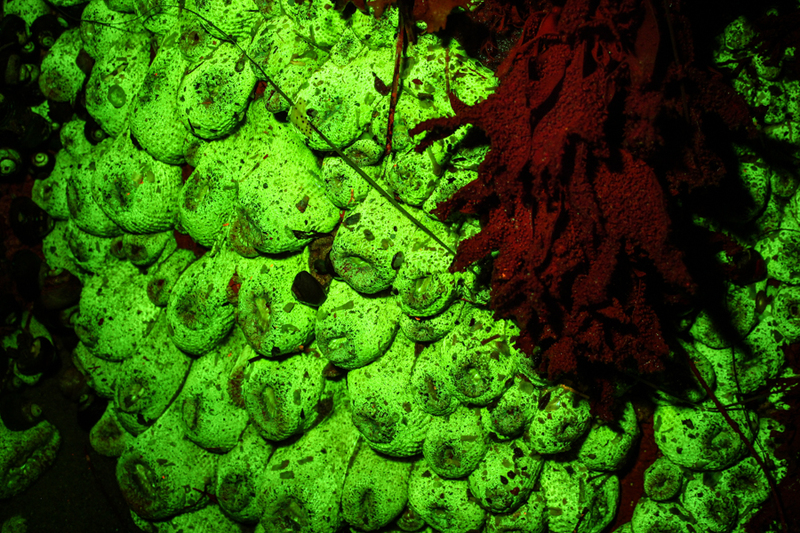 Almost any area of the life-covered rocks reveals unexpected color and detail in fluorescence. 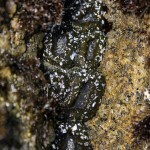 There is also surprise in the seaweed. 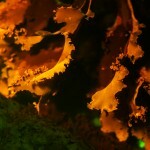 You generally only see the characteristic deep red fluorescence from chlorophyll in algae, whether encrusting a surface as in many of the images above, in symbiotic algae, or in seaweed. 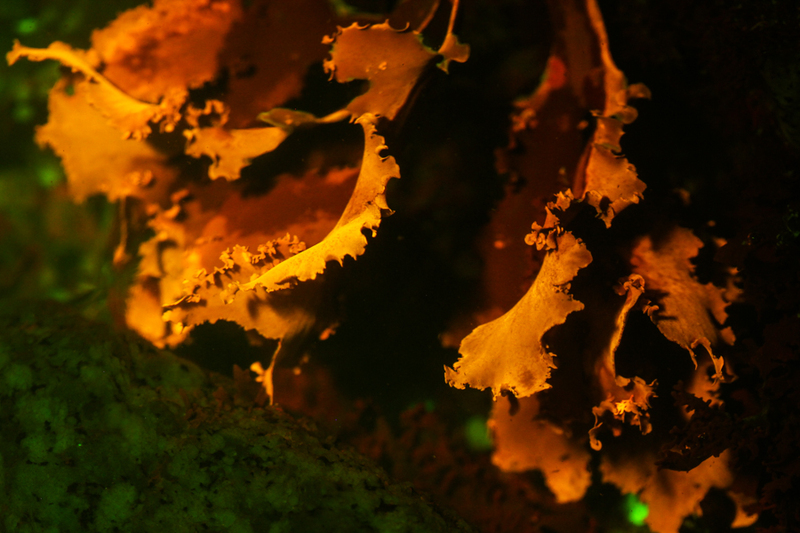 The red algae (Rhodophyta) contain a photosynthetic accessory pigment, phycoerythrin, that captures wavelengths of light that chlorophyll does not absorb well. 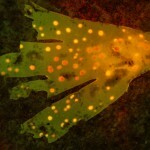 In a healthy plant the energy absorbed by phycoerythrin is transferred to chlorophyll with very high efficiency, but when the plant starts to decay the system is uncoupled and the bright orange fluorescence of phycoerythrin is revealed. 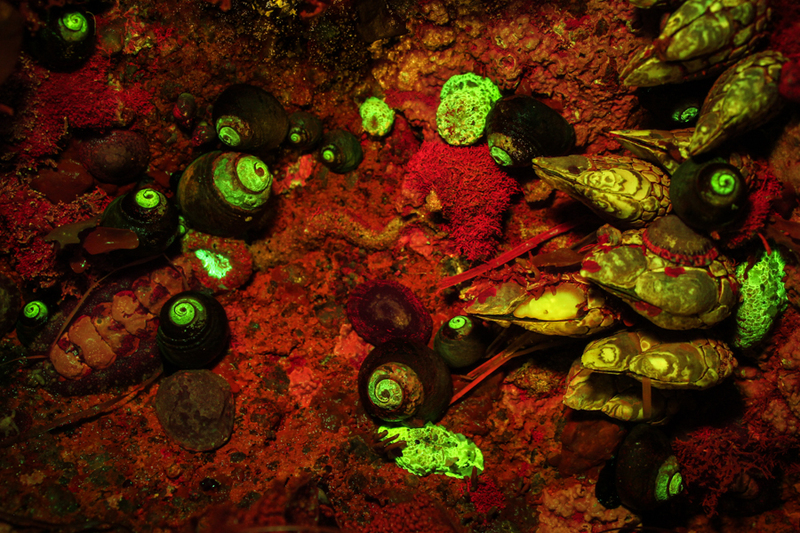 Once again we see how fluorescence reveals hidden aspects of life. 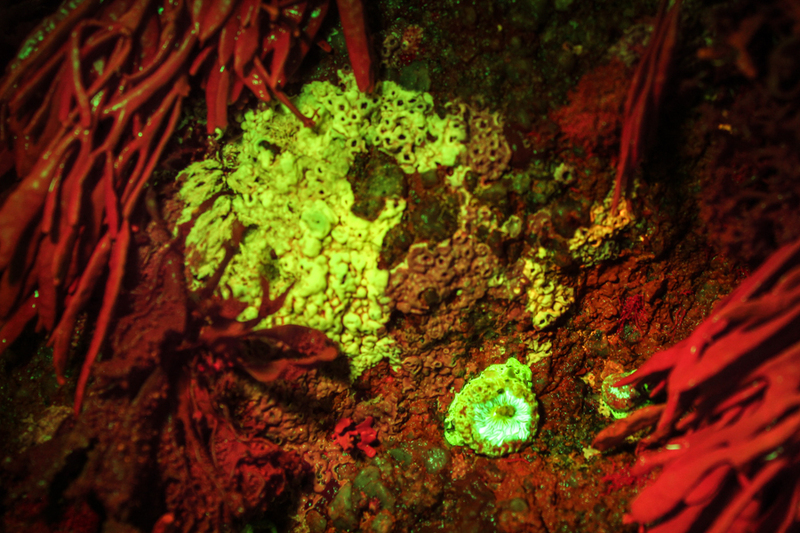 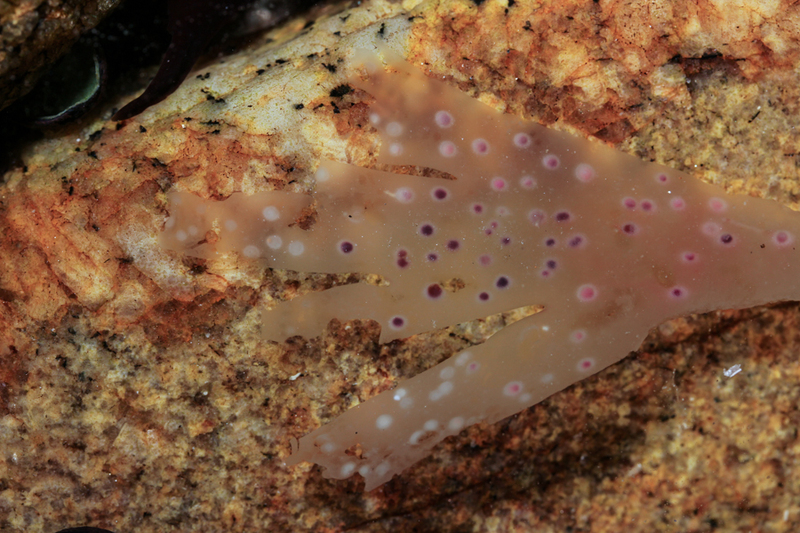 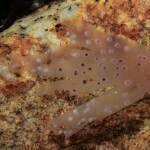 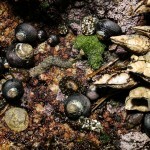 Just a few brief visits to tide pools yielded images of a wide variety of fluorescence effects in diverse organisms. 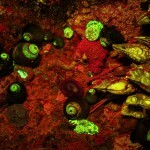 There is still much more to be observed, imaged, and understood. 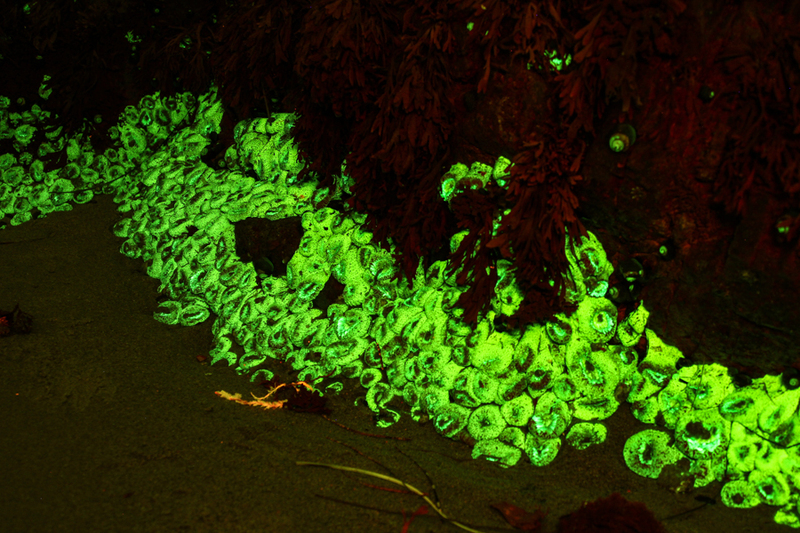 The images here are at a macroscopic scale but even at a micro scale fluorescence reveals a lot. 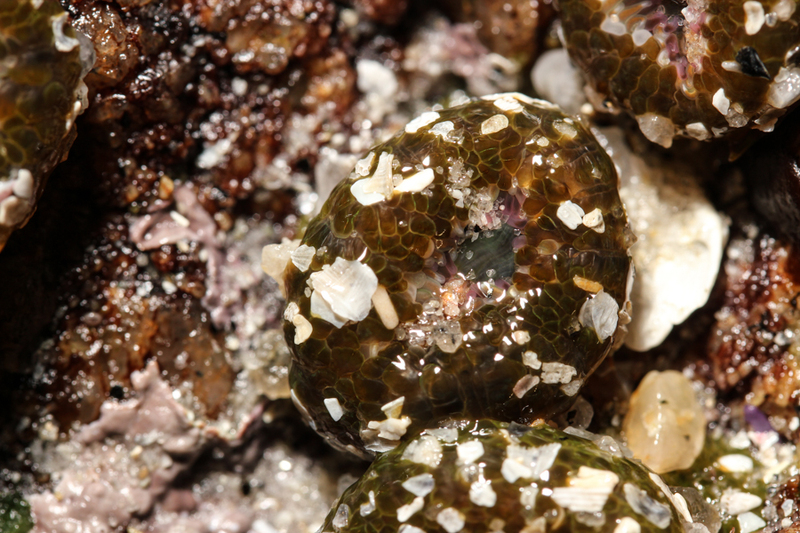 In a separate article you can see examples of white-light and fluorescence microscope images of a sand sample collected from the Asilomar State Beach tide pool.